I’m officially less than four weeks out from my due date, you guys. It’s getting real. Really real. And the reaction to this impending reality of ours — that is, the oh-my-gosh-we-are-going-to-have-an-infant-we-need-to-keep-alive-soon reality — has manifested itself in very different ways. My husband, for example, has taken to doing crazy things like organizing the basement and cleaning out the car. If you know my husband, you know this is so far out of character (to explain, in college he had a constant pile of junk next to his bed dubbed “Mount Elliott,” a tradition he has maintained since college). I am obviously taking as much advantage as possible of this boost of cleanliness and orderliness from him, but the craziest part of it all is I don’t even have to ask him to do these things. He is choosing to do them on his own — in fact, I didn’t even come up with the idea to clean out the cars. He’s a new man. I am blissfully (read: ignorantly) hoping this change sticks. As for me? I’ve been busy inventing new ways to pick things up off the floor (because it’s kind of impossible to bend down when you have a watermelon for a belly) and cooking/baking up a storm. This yummy caramelized spring onion and fennel pizza on a homemade beer crust was my most recent accomplishment — well, that, and picking up a pair of socks off the floor using my big toe. Of course, there was an even more pressing reason for me to bake a pizza and that reason is NoshOn.It’s #PizzaWeek. 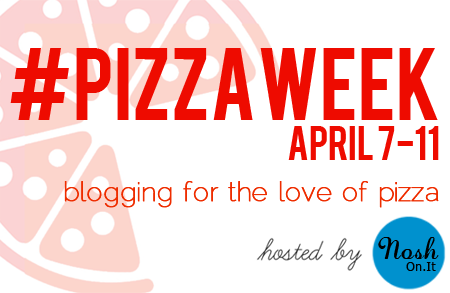 Today kicks off the exciting extravaganza that is bloggers showcasing their pizza best. And let me tell you — if you didn’t think you were having pizza for dinner (or breakfast, or dessert) every day this week, once you see what everyone is making you will want to change all your plans. #PizzaWeek comes at a great time for me (though really, can a week dedicated to pizza ever come at a bad time? I think no) because homemade pizza has been on heavy rotation in our kitchen lately. And frankly, while I just can’t pass up the ease and deliciousness that is homemade pizza, it’s been getting a wee boring. So when #PizzaWeek approached I knew I had to make something with a little more pizzazz, va-voom and bow-chicka-bow-wow than our go-to mushroom and pepper with cheese getup. 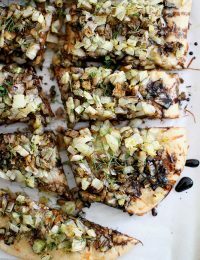 This caramelized veggie pizza with a balsamic glaze and boozy crust was the answer — the sweet, savory, cheesy and carby (do I hear that choir of angels?) answer. Spring onions and fennel are not what I would immediately think of when I think of pizza toppings, but this recipe just works. You chop up the veg and cook it low and slow so the zesty, fresh flavors meld together and caramelize, leaving a sweet aftertaste. Roll out a homemade beer pizza crust, top it with some oil and shredded Parmesan, top that with the veggie goodness and bake it all to golden perfection. But that’s not all — we also drizzle on a sweet balsamic reduction because we can, that’s why. Now if you’ll excuse me, I’m off to go drool over what everybody else made for #PizzaWeek and snack on the few leftovers we have of this pizza while my husband color-codes his magazines (JOKES — he hasn’t gone that far. Yet). Heat oven to 425 degrees F. Heat 1 tablespoon olive oil in a large skillet over medium heat. Add chopped onion and 1 1/2 teaspoons salt. Cook, stirring often, 5 minutes until onion is soft. Add chopped fennel and minced garlic; cook, stirring often, 5 to 7 minutes until fennel is slightly softened. Reduce heat to low. Cover and cook, stirring often, 15 to 20 minutes until fennel is soft and begins to caramelize. Remove from heat. Season with salt and pepper to taste, then stir in the fennel fronds. Pat the prepared beer pizza crust dough into a thin circle or rectangle on a pizza stone or parchment paper-lined baking sheet. Brush top with remaining 1 tablespoon olive oil; sprinkle with shredded Parmesan cheese. Top evenly with onion-fennel mixture. Bake 10 to 15 minutes until cheese is melted and crust is golden brown and baked through. Meanwhile, make the balsamic reduction. In a small saucepan, bring balsamic vinegar just to a boil; reduce heat to a simmer and cook 15 minutes until thickened and reduced by half. Remove from heat; cool to room temperature before drizzling over pizza. Pizza week sounds awesome and I just love getting new ideas! This pizza has my name all over it! Awesome vegetables and a beer crust?? Died and gone to heaven. So, so good.. Love hearing your pregnancy happenings. It’s amazing what you can do when you have to right? Love that you husband is nesting too.. So sweet! Yay so pumped about Pizza Week! I could eat this pizza all week long. That topping is about to make me go crazy as! I am in love with the flavours. Good luck over the night few weeks; take care of your self. That crust looks insaaaaane! So yummy. I can’t freaking wait to try! 4 weeks! Oh man, how did that happen? So exciting!! Love this pizza and the idea of pizza week. So fun! Beer crust?? Yes please! And love the idea of making a balsamic glaze! Leave it to NoshOn.it to come up with a geeenius idea like pizza week! LOVE this! 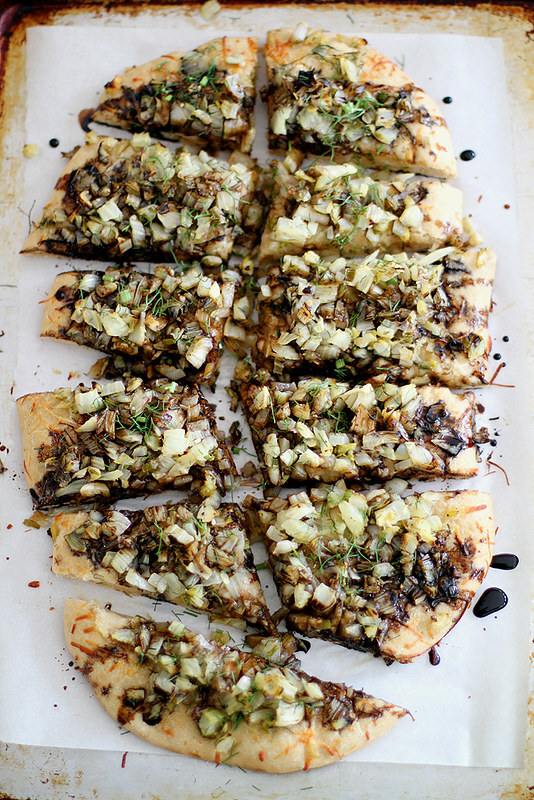 I’m dying over the caramelized onions and fennel – so spring-y and tasty! AH! What is with men and their piles o’ stuff by the bed? My husband does the same thing. It’s sort of (majorly) infuriating. Glad you’re seeing some end of pregnancy perks though in this burst of cleanliness! You guys are going to be such great parents, I’m sure of it. And I bet your kid will like fennel too. Because, hello, you put it on pizza! And what kid doesn’t like pizza? I call that a parenting win. I am so giddy for you! The baby will be here before you know it. And yay for pizza week!!! Caramelised onions are one of my absolute faves! Love the flavours you’ve got going on here. I’m totally for nontraditional toppings on pizza — in fact, when it’s homemade I prefer it! I’m loving all these girl, so springy! And I CANNOT believe you are only four weeks out from your due date — eekkkkk!!!! So so excited for you to meet your little one. I love the idea of pizza week, even better how about pizza year? I could eat pizza every single day. Since it’s suppose to be 70 on Wednesday (I live in MN too!) my, hubby, daughter and I are planning on grilling and maybe I’ll suggest grilling pizza? There is seriously nothing better than crust on the grill. I’ve never had fennel on pizza, totally going to give that a try. Oh my heavens, this looks incredible!! Love the springy flavors and that boozy crust sounds fantastic. Love it all! Katrina — The crust really is the best part — I could eat it plain. Thanks, dear! DessertForTwo — Why thank ya, dear! Julia — I think every week should be pizza week from now on, really. 😉 Thanks, love! Courtney — Haha, I guess I could take this as a pre-victory for parenting skills! 😉 Thanks, friend! Lauren — Gah, I know! I’m majorly excited/terrified. 🙂 Good thing I have a week of yummy pizzas to distract me. Nicole — I just couldn’t wait for spring any longer so I had to put it on a pizza. 🙂 Thanks, dear! I’m so excited about baby, too (and nervous ;)). Jenna — We totally have grilling plans for Wednesday, too (yay for spring in MN, FINALLY)! I think a grilled pizza is a great idea. I always love onions on pizza. delicious recipe! Ilona — Me too! Thanks so much. OMG this looks so insane!!!!! I can’t stop staring! Gorgeous way to kick off pizza week! Eeeeps!!! How exciting! “New ways of picking things up off the floor”…I can imagine. Also, you’ll probably need that skill when s/he starts crawling. The pizza looks incredible! Yum! 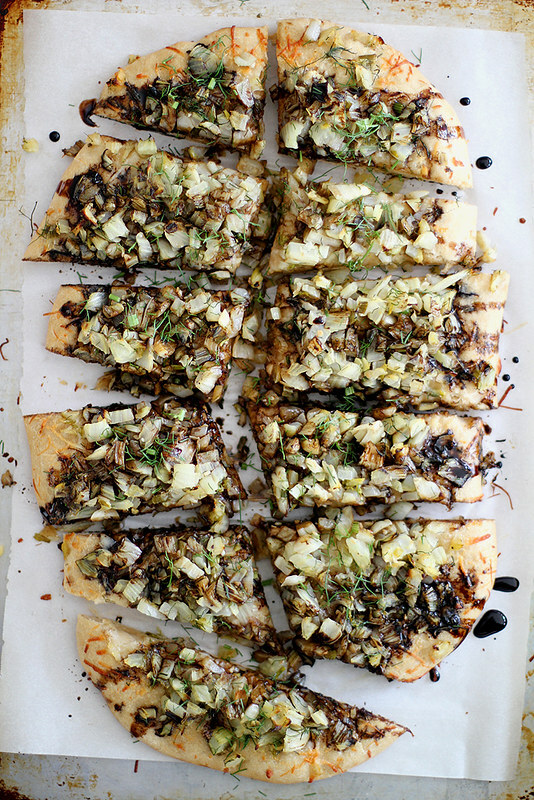 You had me at caramelized spring onions, love this pizza! This pizza sounds amazing! Pizza Week–genius! Wow, I can’t believe you are getting so close. I am so excited for you!! And yay for pizza week, I probably need to celebrate this one. Say wha pizza week? Where have I been and how didn’t I know about this! I could eat this every day this week! Delicious! Caramelised fennel is right up on my list of fav pizza toppings. And – you’re four weeks from your due date?! So exciting! I’m four weeks from A Level exam period.. not so exciting. first, I cannot get enough pizza lately. like, I want pizza all day, everyday. second, I was visiting my friend in Feb…about 4 weeks before her due date…and we were shopping for baby stuff, when a woman knocked a bunch of onesies off a rack, then proceeded to ask my 8-months pregnant friend to pick them up for her?! I mean, really? Joyti — For real; good thing I’m getting my practice in now. 😉 Thanks! Cindy — dWHAAAT. That is cray on so many levels. Thanks for the motivation to make some homemade pizza this week! This pizza looks and sounds heavenly! I must give that beer crust a try! Alexe — I know, it’s so close (yet this month feels like it’s dragging already :))! And I love all the health benefits of fennel, too — gotta love a pizza that’s good for you, too. Stop it right now!!! This pizza looks amazing. All that fennel! Swoon. Oh my gahhhh – every flavor and ingredient in this pizza – I seriously want right now!! I don’t care I just busted out laughing at “bow-chicka-bow-wow” in the middle of my newsroom. Our virtual blogger friendship was meant to be (and I need to make this pizza/pin it to my pizza board ASAP; looks amazing)! I hope my boyfriend has the same shift towards spontaneous cleaning when we start having children!! Caramelized Fennel! On a pizza. You are my hero. Looks super delicious. Our husbands sound like two peas in a pod – Eric got super “nesty” the weeks before Owen arrived too. Milk it for what it’s worth, lady! 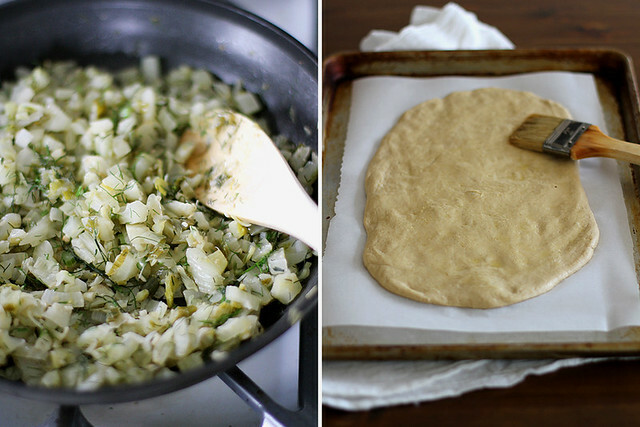 I like fennel but never thought to use it on pizza mixed with onions and beer! Pictures looks fantastic. Makes it look like I can just reach into my computer and try a piece! I must say that I am impressed that you can be at the end of your pregnancy, still do blogging, put together an E-book and make it all look easy. Mom — You?? Like FENNEL?? Say it ain’t so. 😉 I’ll definitely make this when you’re up here, then. Oh my gosh — this crust!!!! Wow! Ah, yes the old toe grab. You’ll still need this skill once Avery arrives! Oh and as for clothes mountain (that is what Mike’s pile of clothes is called), it will return. With a vengeance! Pizza week is like my dream come true. I could eat pizza every single day of my life. And this beer crust with balsamic glaze? Yes, always yes! Every week should be pizza week or at least have it once a month! This pizza looks delicious. 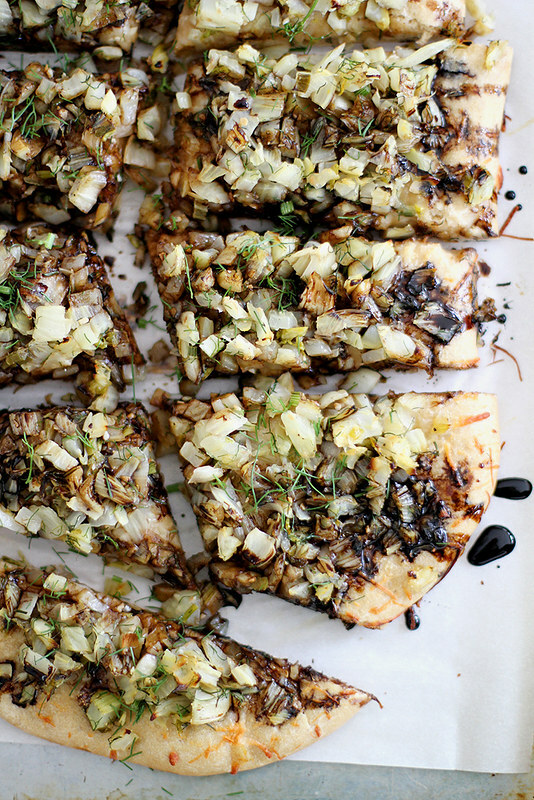 Caramelized onions and fennel drizzled with balsamic all on top of a beer crust, sign me up! Congrats on the upcoming babe! I couldn’t help but giggle as I read through remembering when I couldn’t bend down with either of my boys. Good luck with everything and this pizza is fab- love the beer crust! I make pizza for my kids pretty much every Sunday for lunch. It’s a clean out the fridge and lets use up veggies!! Stop…just stop with the car cleaning. It’s fruitless and your hubs could be sleeping or having a beer instead. I think there must be about 5,000,000 small chunks of granola in my car. Great pizza!! I am totally amenable to being peer pressured into making pizza every day this week! BIG YUM to this. And if your husband wants to peer pressure my fiance into cleaning…I’m down with that too. Can’t even tell you how excited I am for you, Steph! So glad to be on this crazy train with you. It’s surreal, exciting and totally overwhelming. Similar to how I’d feel about this pizza if it were in front of me… before devouring it whole. Beer crust?! UH, YES. Oh man, this looks good! I put brussels sprouts on a pizza the other day and it made me want to experiment with more unusual topping ideas. Hello, this pizza! Oh my goodness I am in love with this pizza! 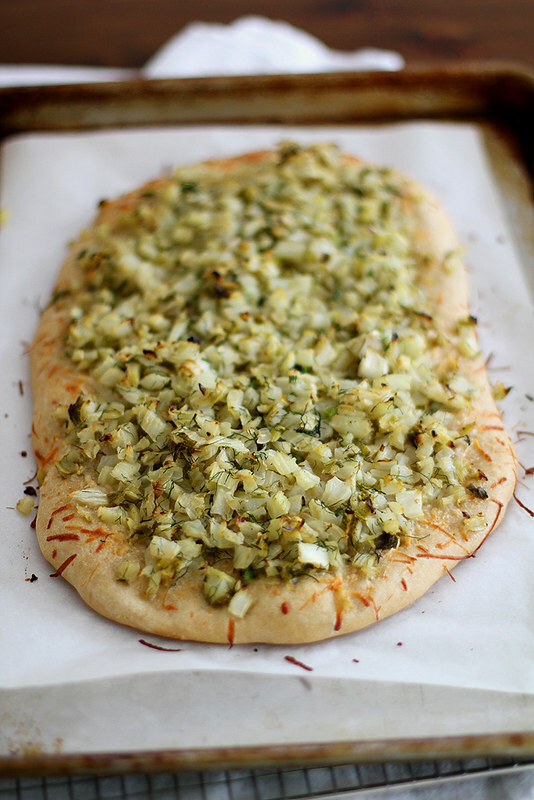 Love the combo of onion with the fennel and beer crust! Way too funny about your husband I remembered mine decided the bathroom needed to be remodeled a week before our son was born so we came home to a bathroom without a floor or a sink! Praise the lord he finished the project on his vacation! Good luck with the baby, I hope you have a very healthy little girl and an easy delivery! Girl, this looks amazing. Yay for clean husbands. Hmm, so having a baby=husband cleaning. I’ll keep that one in my back pocket for later 🙂 I just picked up a gorgeous, wild-haired bulb of fennel at the market today. Pizza it is! Pinned. You must be so anxious to have your baby! Looks yummy! Wow, you are getting so close Steph – wishing you an easy and super smooth labor and hope you get to try and get some rest and relaxation for the next few weeks before sweet baby girl arrives 🙂 Totally in love with this pizza and all the flavors!